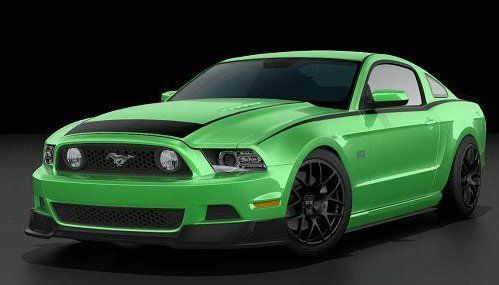 The 2013 Ford Mustang RTR Spec 1 package is available for V6 and V8 models. 2013 Mustang RTR Spec 1 begins on the outside with an RTR appearance package that adds a unique front fascia, a low profile rear spoiler, a unique license plate surround, 19” RTR aluminum wheels (matte charcoal or silver) wrapped in high performance Falken FK 453 tires and RTR badges on the fenders and on the rear deck lid. Inside, the 2013 Mustang RTR Spec 1 package adds an RTR shift knob, embroidered floor mats, interior badges and a serialized dash plaque signed by Vaughn Gittin Jr. Finally, the performance of the Mustang RTR Spec 1 is enhanced with a Ford Racing lower spring package that drops the car an inch along with an RTR axle back exhaust system that adds 9 horsepower to those models equipped with the 5.0L V8. The 2013 Ford Mustang RTR Spec 1 carries an MSRP of $6,250. Those who want even more out of their Vaughn Gittin Jr designed pony car can opt for the 2013 Ford Mustang RTR Spec 2, which is available strictly with the 5.0-powered Mustang GT. On the outside, the Mustang RTR Spec 2 begins with all of the physical features of the Spec 1 package but the higher performance package adds a unique rear diffuser that wraps around the dual exhaust, rocker splitters, a rear deck lid appliqué in place of the standard chrome badge and RTR signature graphics on the hood and down the sides of the car. Inside, the 2013 Mustang RTR Spec 2 offers the same items as the Spec 1 package. Where the 2013 Ford Mustang RTR Spec 2 really differs from the Spec 1 package is in performance – as the Mustang RTR Spec 2 has been enhanced in a multitude of ways. First off, the Spec 2 package begins under the hood where a K&N filter package and a Ford Racing ECU tune work with the RTR axle back exhaust system to add an impressive 25 horsepower and 60lb-ft of torque for a total engine output of 445 horsepower and 450lb-ft of torque. Next, the suspension system of the Mustang GT is pretty much completely overhauled with a bevy of items from Ford Racing and RTR. Ford Racing contributed lowering springs (buyer’s choice of 1” or 1.5” drop), adjustable shocks and upper shock mounts while RTR added their own 4-way adjustable front and rear sway bars, an adjustable panhard bar and a rear chassis support. The same 19x9.5” RTR rims wrapped in Falken FK 453 tires are found on the Spec 2 package but behind these charcoal or silver wheels is an upgraded braking system featuring cross driller, slotted rotors. "We have spent a lot of time testing the new suspension package," says 2010 Formula Drift Champion, Vaughn Gittin Jr. "I worked alongside very experienced suspension engineers and other pro drivers to deliver our goal; a very well-balanced car that offers RTR owners the ability to adjust the suspension to suit their driving style without sacrificing ride quality. Without question it is one the most impressive handling and fun-to-drive Mustangs out there." In addition to these two packages, RTR also has optional items for the 2013 Ford Mustang RTR Spec 2 that includes the buyer’s choice of either the 525 or 624 horsepower Ford Racing supercharger packages but no prices have been offered from RTR for these high performance options at this time. The 2013 Ford Mustang RTR package (whether Spec 1 or Spec 2) is available as a post-title package at a variety of Ford dealerships and custom performance shops around the world with 33 available installation locations in the US, 2 in Canada, 1 in Europe, 1 in Puerto Rico. The gallery above on the right (click any thumbnails to view the whole gallery) shows the 2013 Ford Mustang RTR in both Spec 1 and Spec 2 trim.